As soon as Paizo announced Pathfinder, I was excited. The chance to be a part of a new setting, build through adventures, from the ground up? Yes, please! 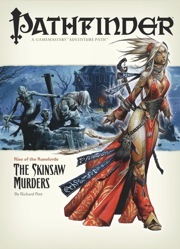 Fellow WereCabbage, Richard Pett, wrote the second chapter in the Rise of the Runeloards Adventure Path: The Skinsaw Murders. I’m downloading it right now, and can’t wait to see what nifty things he put in there. A sudden string of brutal killings terrorizes Sandpoint, and the killer’s mark bears a disturbing similarity to the strange rune the goblins in the previous adventure had taken as their tribal totem. Investigation leads the heroes to confront a sinister murderer who has claimed a notorious haunted mansion as his lair. Yet this murderer is one of many, a member of a group of killers who call themselves the Skinsaw Men and have adopted an ancient magic involving the seven deadly sins. The PCs must travel to the bustling city of Magnimar to unravel the truth behind the rune, but in so doing may become prime suspects in the killings themselves! This entry was posted on Saturday, October 6th, 2007 at 09:51 and is filed under Uncategorized. You can follow any responses to this entry through the RSS 2.0 feed. You can leave a response, or trackback from your own site.